Beyond the glitter of the Las Vegas strip where fortunes are won and lost, lies a little lake that holds a piece of Cold War history thats been hidden for half a century. What started out as a stop over for GIs on the way to the West Coast grew to be one of the most exciting and controversial cities in the nation. Who would have thought it would become a technical divers playground as well? In the desert, not many people would really think of scuba diving, let alone diving on a WWII B-29 bomber called the Super Fortress. But Lake Mead, just outside of Las Vegas, Nevada, has become quite a divers paradise. Lake Mead holds many sunken treasures for the adventure minded scuba diver, including a PBY Mariner, Wreck Alley, and the B-29 bomber. The lake has many great technical dives that could keep an avid diver content for days or even weeks. 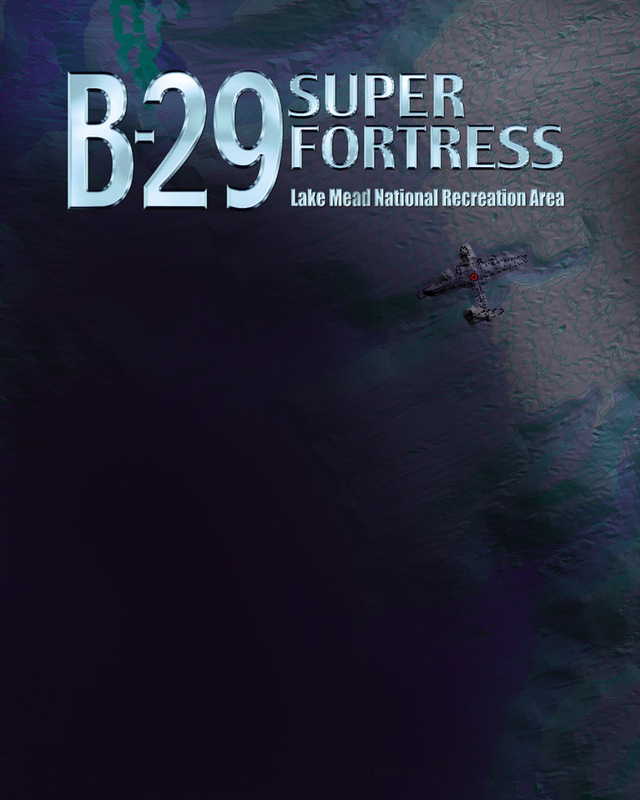 The crown jewel, and the most fiercely protected dive site in the lake, is the B-29 S/N RB29A 45-21847. WWII brought about a need for long-range bombing campaigns. Boeing was awarded a huge US Air Force contract to build the B-29 bomber, a long-range high-altitude heavy bomber. The two most well known B-29s are the Enola Gay and Bocks Car; they carried Little Boy and Fat Man, the first two atomic bombs to be used in wartime. The devastation these two bombs brought about caused Japan to surrender, and so ended WWII (August 14th 1945). The next few decades saw a realigning of world powers, and the start of the Cold War. On September 13th 1945, Lake Meads B-29, serial number 45-21847, was put into service. In 1947, that B-29 was stripped of her armaments and re-classified as a reconnaissance B-29 and moved into the Upper Atmosphere Research Project. The purpose of this project was to develop an intercontinental ballistic missile guidance system that used the sun for direction and positioning. Due to the threat and increasing tensions with Russia over the Cold War, Sun Tracker was developed and needed to be tested. Sidescan sonar outlines the unmistakable shape of the B-29 Super Fortress on Lake Meads contoured lake bed. 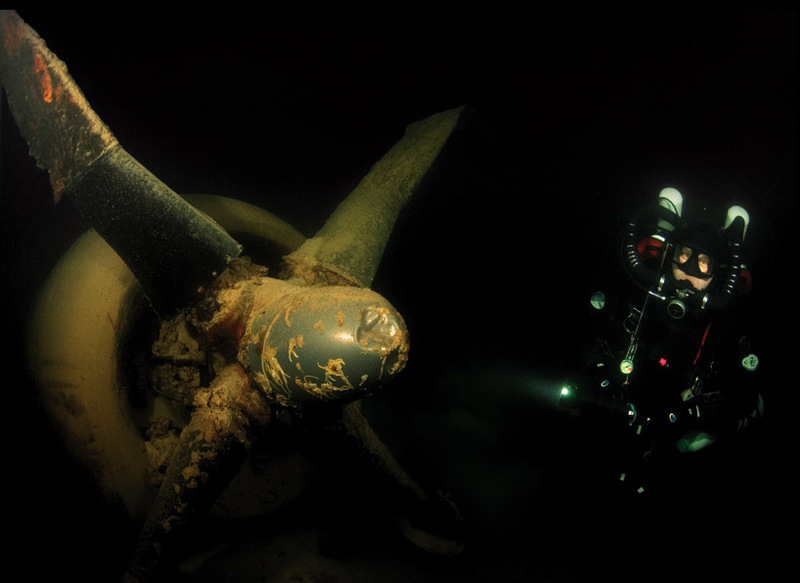 Lake levels that have dropped over 100 feet during the last decade have brought the historic aircraft almost within reach of recreational divers. To test the accuracy of Sun Tracker, a plane capable of high altitude flight followed by a rapid low level flight was needed. The B-29 was the first mass-produced aircraft with a pressurized cockpit, which was what was needed for such testing. The other appealing feature of the B-29 for this test was that after WWII there were many surplus B-29s available. Lake Mead was chosen as a testing area due to its remote location, availability of the sun, and because it was relatively unobstructed by obstacles, an important feature for low level flying  with the exception of the lake, of course! The only distraction may have been Frank Sinatra at the Tropicana that week! On July 21, 1948, the B-29 plummeted from high altitude down to as close to the lake as possible. Unfortunately, Captain Robert M. Madison lost his depth perception and plowed the huge plane into the lake at 230 mph. The impact tore off all but one of the engines and sent the plane skipping along the lake surface. When she eventually stopped, she began to take on water and started to sink. Fortunately, all of the crew was able to escape into life rafts and wait for rescue. And so ends the history lesson. Lets go diving! Viva, Las Vegas! Here we are, but not for the standard tourist reasons. Most folks go to Sin City to gamble, get married, or participate in various other activities, so flying with hundreds of pounds of scuba gear will get you a second look by the airlines and our friends at TSA. Between the airlines seeing an opportunity to make more money with overweight baggage, and your average TSA agent, the technical scuba diver has an interesting day ahead of him. Flying is always a challenging compromise and battle of wits. Our expedition to Vegas for diving was the last week of December. Joel Silverstein from Tech Diving Limited invited us down to experience the B-29. This was to be a down-and-dirty end-of-year look at the B-29 and some other technical sites in Lake Mead. We finally arrived late that night at our two-star hotel by Hoover Dam. The wind was really howling. I went to bed hoping that it would subside over night. Of course, I was not so lucky and the wind was still going strong the next morning. The bent propeller wings on engine #1 show the force of the impact onto Lake Meads water surface. Joel Silverstein, rebreather diver and dive permit holder, pauses for a photo beside this massive engine. We arrived at the boat ramp inside the Lake Mead National Recreation Area, and started preparing our gear. We were all diving closed circuit rebreathers. Curt and Joel were using KISS Classics, and Erik and I were using COPIS Megalodons. We decided on a mix of 10/50 as we were also going to dive some of the deeper wrecks in Wreck Alley after the B-29. Joel was overjoyed to dive such a high helium mix. While I was eagerly putting my gear aboard, I could see in John and Joels eyes that this day might be a wash; but, like troupers, we headed out of the harbor to take a look. The waves were four to five feet, which is more than we wanted to fight for an hours ride out to the B-29. Not to mention that things can change fast, and for the worse I am told. Up to this point in my diving career, I have never been blown out of a dive; so Im having a hard time realizing that I might not get to dive in the lake today. We are not talking the ocean here, so what the heck? We return to the dock and play the hurry up and wait game for the next three hours. The winds do not drop, and Joel finally calls it: the day is over and we will try again tomorrow. Now it is official. I have had my first dive scratched, and it was on Lake Mead. Im starting to get an appreciation for the size and strength of this lake. Oh well, the day is still young and we are divers in Las Vegas, so off to the bar to toast to our defeat! Attempt two. We decide to launch from Echo Bay Marina this morning, which is a few miles north of our first launch site. The B-29 is only about 20-30 minutes from here as compared to an hour or more from Lake Mead Marina. The winds are fairly light and we are cautiously optimistic. After loading we head out, this time to a completely different lake. We make it to the B-29 site, and begin to suit up. Joel, Curt, Erik, and I jump in and begin our descent to the bottom. The B-29 just a few years back was on the bottom in over 240 feet of water; but today, because Lake Meads water level has dropped over 100 feet, the B-29 now sits in almost a recreational divers depth of 140 feet. The National Park Service has set up a permanent down line to the B-29 to protect her from carelessly dropped anchors or drop lines, and really went all out setting this up. Two 12,000-pound concrete blocks anchor the main down line that your surface support vessel is attached to. I guess they did not want their marker moving! To further protect the plane, you now have an 87-foot swim to the next 1000-pound concrete block that is around 20 feet aft of the tail section. The theory on this long swim I am told is two-fold: one to get your buoyancy worked out before you get to the plane, and the second reason is to prevent anything that is accidentally dropped off the surface support boats from hitting the plane. The next line was from this cement block going to a copper stake that is right next to the tail section. Above: Ripped from the plane during the crash, a lone oxygen cylinder that was used for high altitude flights sits on the muddy lake floor. 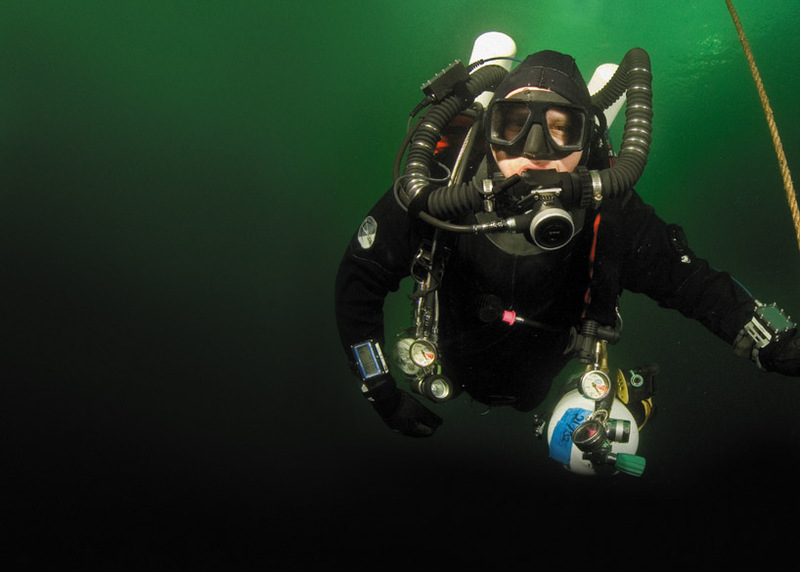 Right: Tucked tight and warm in his drysuit, Joel Silversteins KISS classic rebreather provides the optimal gas mix, optimizing his required decompression  a small payment to visit such a unique and historical dive location. 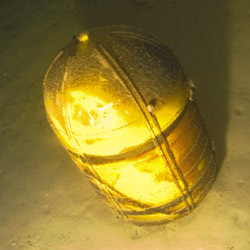 The first object a diver will get to see is the oxygen cylinder that lies just off the port tail section. This is my first stop on the tour. I grab a quick few pictures of Erik with the oxygen cylinder. Like most lake dives I have experienced, the lake bottom is very silty, and it is best not to even get close to it or the visibility will be ruined. Joel and I now head for the port #1 engine. Part of Joels job was to be a great buddy, but his main job was to be the lighting man with the two 50-watt HID lights from Salvo. These lights were like having our own hand-held sun with us! The number one engine is the only engine left on the plane and it makes for a great photo-op. The propeller is sitting almost squarely with two blades on the bottom and two blades pointing up. All the blades are bent pointing port (left). This is due to the engine running when it impacted the water. The hypothesized reason for the #1 engine surviving the impact while the other three were torn from their nacelles is due to the right bank of the aircraft on impact. If you get a chance to dive this B-29, I recommend getting a few shots here. The B-29 is covered in a layer of silt. It almost looks like the plane is totally brown, but every now and then you can see a spot that has no silt with the original aluminum skin showing through. If you look closely at the upper prop blade, you can see some corrosion that almost looks like a rusticle. We now swim to the cockpit, and the first thing I notice is the pilots window that is pushed out where he must have escaped. The nose section sustained a large amount of damage and is now completely open allowing the diver to peer into the cockpit. There is a folded parachute, a crescent wrench, and a pair of pants lying undisturbed. It has been rumored that there is a $100.00 bill in the pants. As this is a do not touch wreck, we may never know whether this is a fact or just a tale. Circling around the starboard side of the cockpit, you will see that the co-pilots window is also pushed out. Looking inside, you will see another parachute lying next to the pilots seat. We now ascend a bit to take a look at the Sun Trackers dome. Unfortunately, as we are not allowed to touch the plane, we cannot clean off the dome, so all we see is a dome covered with silt, not too exciting. We continue past the radio antenna and tour down the starboard wing. Engines three and four are missing. The jagged remains of the engine nacelle and controls are all that is left. The nice thing about this wreck being in 140 feet is that you can spend a long time examining her. We head to the tail section. Joel, Erik, John, and Curt all take their turn at posing for a picture. The leading edge of vertical stabilizer is missing a chunk just like a bite was taken out of it. The joint between where the vertical stabilizer meets the fuselage is fractured and bent towards the port side of the plane. This damage is likely due to the planes impact on the bottom that has an upward slope here. The rudder sustained some horizontal damage that looks like a can opener had peeled a layer back. Part of the B-29s serial numbers (45-21847) can be read on the rudder 5218. The fabric on top of the elevators has been punched through and is mostly torn. The damage looks like it is post-crash and likely caused by a diver carelessly putting lighting or other camera equipment down on them. We were extremely fortunate to get to spend almost an hour on the wreck; but now it is time to return to the surface. First the swim back to the 12,000 lb blocks, then a 45-minute ascent. Upon surfacing, the weather had become a bit windier and the waves were starting to build. John and Joel decide it is best to head in and call it a good day. The B-29 is an incredible piece of history, relatively undisturbed and frozen in time in the 1940s. If you get an opportunity to dive this wreck, I would definitely suggest doing it. 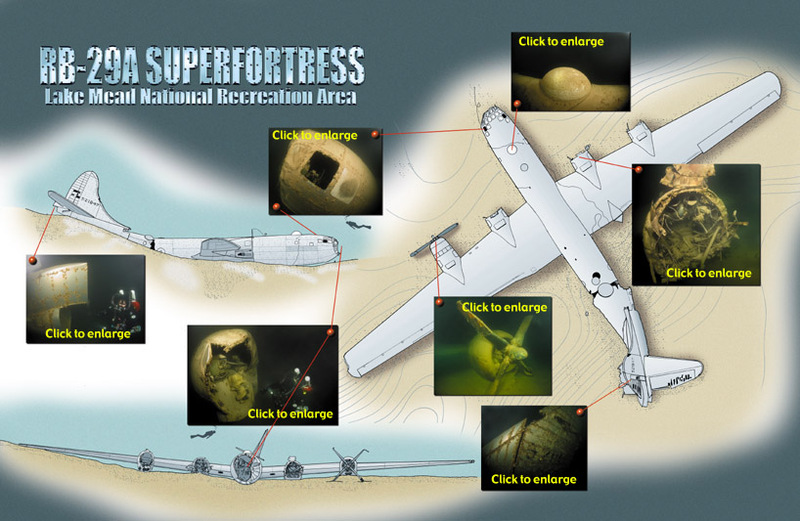 The National Park Service (NPS) opened the B-29 to divers under very strict conditions in July 2007 for a six-month trial. Two companies were issued commercial use authorization (CUA) to have a finite number of dives on the B-29. Joel Silverstein the CEO of Scuba Training and Technology Incorporated (928-855-9400 e-mail: joel@techdivinglimited.com) was one of the companies. Joel has submitted his permit request to NPS again. At the time of writing this article, the requests are stuck in a bunch of red tape and typical bureaucratic delays. The purpose of only permitting controlled diving on this wreck was to preserve it for all Americans and others to enjoy for future generations to come. The NPS was pleased with the overall preservation of the site by the two CUA operations. It is really too bad that in a country where freedom is prized, we are being prevented from experiencing such a great piece of history. I want to thank Joel for his expertise on this site and for being a great dive buddy. I also want to thank John Fuller, our boat captain, for running a top-notch trip for us. And Salvo (www.salvodiving.com), who loaned our expedition the 50-watt HID lights, which were extremely valuable in getting all the great still and video images, thanks! Special Note: Since the release of this editorial, the National Park Service has closed the B-29 site for diving. Immersed in cool green water as he completes his required decompression time, Seattle diver Curt McNamee daydreams of the dive he just completed on the B-29 Super Fortress.